OK lets see I usually go by Ari or Ar-chan or even Ariaana around the internet. I'm not sharing my name because I don't actually like my name. Any way I discovered SM through the dub I learned about all the changes they made except for one and that would be UraNep cousins nonsense. So yea about that time I stopped watching the dub. About I guess two years ago I discovered PGSM fell in love with it instantly. THan about a year or so ago while looking through different cosplay videos I found the video that Changed SM for me forever (yes I know a bit dramatic but let me have my moment.) I discovered a clip of Destained Couple with soon became my Favorite Sera Myu Song I have since seen every Myu that is recorded and am eagerly awaiting the new Myu. 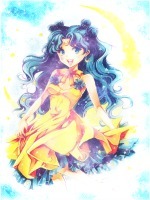 and In case you can't tell by my User name my favorite Characters are Haruka and Michiru. I do a lot of reading, Manga coloring, Writing, and I'm in love with crime shows and multiple other animes. I also have an adorable little kitty that's extremely clingy. I have Rped for several years my first taste of RP was on a chat on Deviant Art and I soon moved on to Forum RP. I enjoy Anime Face claims from time to time thought I have started RPing on Forums that ask for Real Life face Claims. So yea thats me. What are anime face claims? using another character from an anime as an OC for another anime. Such as my personaly favorite Yachiru from bleach as a Sailor Senshi on SM RP's. it works for RP's not in any fandoms also. Oh I see! That's really neat! :3 We should do something like that on here. I love you you know that right?